This is a survey put on by an Action Team of the Campus Compact of Oregon network. Federal policy and national discourse, as well as acts of violence, have disrupted a sense of belonging and safety for Undocumented and Immigrant students both in Oregon and nationwide. Campus Compact of Oregon’s Supporting Undocumented and Immigrant Students Equity Action Team is seeking to unite education advocates across our State and CompactNation, who are providing support and services to Undocumented and Immigrant students and their families in the transition into higher education. Our desire is to create a report that assesses this moment in time for Oregon. We are seeking to collate resources, effective practices, recommendations and persisting questions connected to this focus, for the purpose of advocacy and addressing barriers. Please consider submitting a practice that you or your institution use to serve our Undocumented and Immigrant students. A practice can be anything from a personal decision to check-in with students on-one-one, to institutional policies or specific programs that help cultivate a sense of belonging for our Undocumented and Immigrant students. At the end of the survey, you can also submit recommendations or pressing questions that you would like answered or want shared with a broad audience. 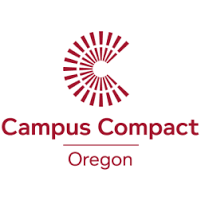 Disclaimer: by completing this survey, you are giving permission for Campus Compact of Oregon to share your submission with others. You will have the choice of whether to associate the practice you may submit to your institution. Personal contact info will always remain confidential. For any questions, please contact Mila at mila@oregoncampuscompact.org.